Home / Roof Raking / Roof Raking Prevents Ice Dams? Ice dams are a hazard of Northern New Jersey and the Hudson Valley in NY winters. They’re not only a nuisance, but they can also be costly and dangerous. We know all about ice dams and roof raking, and we’ve put together a short primer below to help you understand them better. What Is an Ice Dam and How Does It Form? 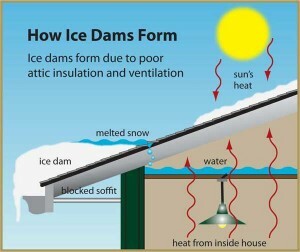 An ice dam is a frozen ridge at the edge of a roof that keeps melting snow from properly draining. It occurs when there are areas of different temperatures on the roof. Snow in a warm spot begins to melt and trickles down to an area that’s below 32 degrees, where it re-freezes. What Kinds of Problems Can It Cause? An ice dam can damage your house, inside and out. Indoors, it can leave you with stained ceilings and damaged plaster. Outside, it can fill your gutters with ice to the point of sagging and can also peel the paint off your house. Shingles can be dislodged. Mold can grow in your home as a result of water leaking in, which can negatively affect your health. There are a couple of things you can do to lower the chance of getting an ice dam. 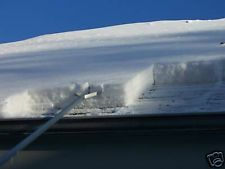 Roof raking is the best way to keep snow off your roof, which lessens the risk of an ice dam forming. A special rake is used when more than six inches of snow accumulates. Caution must be taken when roof raking, however, because the buildup of snow and ice can fall on the person below it. Proper insulation can prevent the formation of an ice dam. It encourages even distribution of temperature, which prevents the melting and refreezing that causes dams. If you find a buildup of snow and ice on your roof every winter, contact All County Window Cleaning. From roof raking to ice dam removal, their knowledgeable team can protect your home from the elements. Call (973) 827-8311 or click here to contact us.